I recently graduated from London Eyes International Academy of Makeup. Attending this Academy was a great experience. The school employs highly trained professionals who are still working in the field of makeup artistry. The instructors were multi-cultural and provided us with the knowledge to work with all ethnicities. They were very forthcoming with suggestions and ideas. The information we obtained geared us to help anyone achieve. Ever since the first day of the school I knew this is going to be something special and I was right. Being a student of London Eyes Inc. was not only knowledgeable, but it was also so much fun. I have learned such more than I thought I would and I am so happy I did. I applaud their hygiene policy because I think it is very important and necessary and being a bit of a germ fob myself I was very comfortable with all procedures we had. Overall I had a great time in my first level and cannot wait to start the second and would recommend it to everyone who wants to get thorough knowledge in makeup. My name is Guadalupe and I was a student of London Eyes. I am happy I attended to this school. They have great teachers and good makeup. I would recommend it to all of my friends. I had a really good time in Level I.
I really love this school. They got very good teachers. For never doing makeup before I learned a lot. London Eyes is very good. I will recommend it to a lot of people that want to start a makeup business. I will come back to learn more. The school was excellent! Very good course for first time students all the way to professional artists who would like a thorough refresher course! Thank you. I came to this school already having a passion for makeup and now it’s even deeper than ever before. London Eyes has helped me learn all the proper techniques as well as hygienic techniques for makeup artistry. I was very happy with the way teachers were so patient and always willing to answer questions. Having it on paper, having the teacher perform a demonstration, and having hands on training was a great way to help me learn. My goal is to become a makeup artist for both hi-fashion and bridal. Thank you London Eyes for helping me feel confident in pursuing my dream. I’m very glad that I found such a professional place to learn about makeup artistry. Teachers were very detailed about every thing and really willing to share their knowledge with us. I liked smoky eyes and bridal. This was the most excited class for me. I’ve been a stylist for 20 years and feel like I have a huge room to learn about makeup. I would like to become bridal makeup artist and stylist in one person and then go to fashion. Thank you. Beauty Makeup Level I at London Eyes Int’l Academy of makeup was very fun and interesting experience for me. It really is a great program for people with little or no experience in makeup industry. The best thing is helpfulness of the instructors. They are always ready to answer any questions you may have. Now, I have more confidence in having a future career as a makeup artist. Only being in one course so far, I am sold! I love it and will definitely be taking the other two levels. I am very satisfied with the classes and have recommended the school to many others that are interested in makeup artistry. I loved it, I thought every makeup artist was informative and helpful when they were teaching us. I have recommended this school to other girls because I liked it so much. I’m proud that I picked London Eyes. One of the things I thought was the most unique and one of the best points of London Eyes was the different makeup artists that taught our classes. I enjoyed hearing from more than just one instructor. We saw different techniques and heard a few different opinions. I believe this to be the most important. When you learn straight from book you don’t seem to get as far. It was really nice. I think the school is fabulous, the teachers are great and they help out if you don’t understand something. You also learn a lot of techniques. I really loved the school. I learned so much stuff I had no idea about such a primer on face and eyes. Now, I know I can use that in my makeup, so it will stay on longer. I thought the teachers were very helpful and nice as well as the other girls in the class. And you will be seeing me again for Airbrush and Level II. Thank you so much. I took the Beauty Makeup course at London Eyes at the end of 2007. I have been doing great with my own makeup business. It has been a fun journey and I am having a great time with makeup artistry. I have opportunities to do makeup for numerous photo shoots and numerous brides and bridal parties. Brides are now the majority of my clients. My work is also gaining international appeal as they have been featured in European, African, and US magazines. Some of my work has also been up on large billboards gracing the streets of numerous African countries. I have flown around the US, as well as Dubai, Europe, and Africa for makeup projects. It has been great, and I thank you for the makeup education. Many people see on my website that I attended London Eyes School and they always contact me and ask for my recommendation on the school, I and of course I refer them to your programs! London Eyes has a wide variety of instructors whose individual styles help you understand different aspects of makeup artistry. 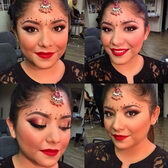 Everyone is very helpful and experienced, so that we gain the knowledge for becoming a talented makeup artist. The classes were very insightful and fun because everyone is very professional yet excited about teaching us. do an outstanding job at teaching the students. You learn so much and have fun all at the same time. I would definitely recommend this school to anyone interested in this field! London Eyes is a great school to study makeup because teachers are honest about your future in the industry and tell us what we really need to know. The school also provides a kit that helps you set yourself a base to start from in assembling your own. Some of the teachers even let you see their own portfolio work, so you can see where the standard is set. London Eyes was very educational. I enjoyed the diversity of the teachers. It allowed us to learn different techniques. It also allowed us to pick which way worked best for us! I would recommend this school to anyone who is interested in a career in makeup. I just want to say I love London Eyes. I have taken Level I class and I am taking Media class now. The teachers are fantastic and are very helpful. I have even had an opportunity to do a commercial and film project through the school. What an experience! The school is very helpful with building your business and portfolio. Experience is great. I can’t wait to take more classes!!!!!!! I would highly recommend London Eyes School. It is a great learning experience and a fun learning environment. All the teachers have field experience and are very knowledgeable. I am actually excited to go to a class every week and look forward to moving up to the next levels. London Eyes also gives great opportunities to practice out in the field you are interested in. I was able to work on the set of a film and it was an amazing learning experience. I now feel more comfortable in starting my carrier. London Eyes is an amazing school in every way! Going into this program, I knew I was passionate about makeup, but now that I have completed it, I feel even more passionate. Every teacher made me love the art and profession of makeup artistry even more by allowing their passion to shine through in their technique and amazing teaching skills. I am sad to leave the school, for now, but extremely excited and anxious to take other classes and begin my carrier as a professional makeup artist. I want to make the school and my teachers proud and to thank them for all they have given me! I loved Level I class. It was the best possible class to learn makeup. They get very in depth with the lessons. You can tell each of the teachers has their own style and you learn that each person doesn’t do things the same way. It is a wonderful class with the best teachers. You are guaranteed to love this course. The class sizes are not too big and the teachers are very one-on-one/hands on when teaching. They really guide you through the lessons. You learn something new everyday.